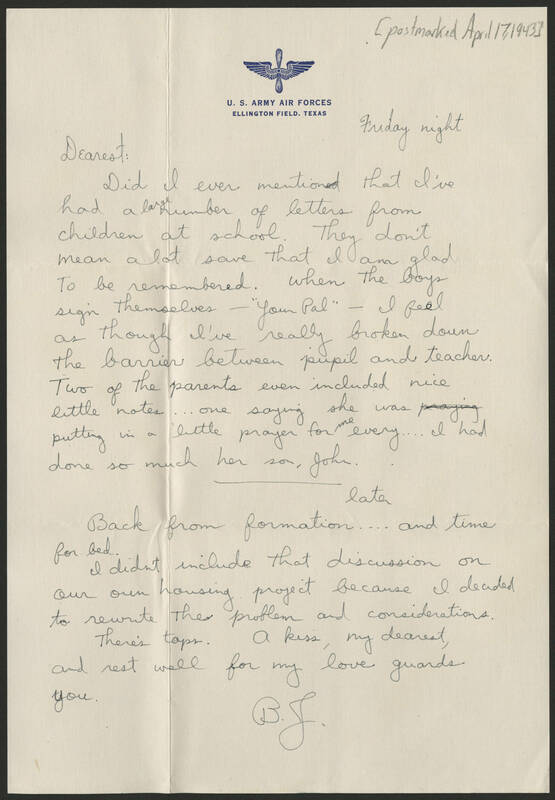 [postmarked April 17, 1943] Friday night Dearest: Did I ever mention that I've had a large number of lettesr from children at school. They don't mean a lot save that I am glad to be remembered. When the boys sign themselves -"Your Pal"- I feel as though I've really broken down the barrier between pupil and teacher. Two of the parents even included nice little notes... one saying she was putting in a little prayer for me every....I had done so much her son, John. later Back from formation... and time for bed. I didn't include that discussion on our own housing project because I decided to rewrite the problem and considerations. There's taps. A kiss, my dearest, and rest well for my love guards you. B.J.